Successfully Added Lenovo HW02 Fitness Tracker Bracelet - Heart Rate Monitor, Sleep Monitor, Pedometer, Calorie Counter, Bluetooth, App, IP67 to your Shopping Cart. Lenovo HW02 fitness tracker bracelet supports you in working towards a healthier future. This stylish orange sports tracker comes packed with plenty of smart health and fitness features. With its Bluetooth connectivity, it can even be paired with your iOS and Android smartphone. When done so, it keeps you constantly up to date about incoming phone calls, messages, and social media updates. Thanks to this, you’ll be able to stay connected to friends and family even while you’re out enjoying a healthy exercise session. With its pedometer in place, this fitness tracker keeps accurate track of the number of steps you took throughout the day. Additionally, it will keep you updated on the distance you have covered and the calories burned. With all this information at your disposal, you can be guaranteed that you’ll always meet your daily exercise levels. Whether you wish to lose weight, gain muscle, or work on cardio – this sports tracker will help you along the way. It even features a heart rate monitor that constantly informs you about your current heart rate. Based on this info, you’ll be able to adjust the intensity of your workout in order to fully optimize it. Like this, you’ll be able to reach your future fitness goals in the fastest and most efficient way imaginable. 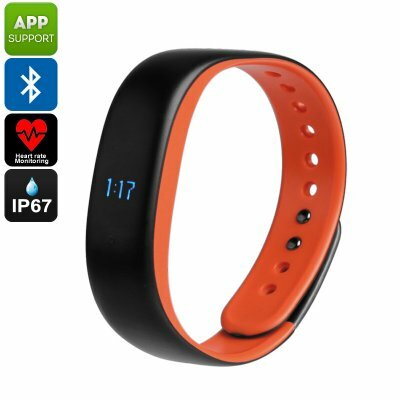 With its IP67 waterproof design, your fitness tracker bracelet can be used in any weather condition. From now on, a little bit of rain is no longer an excuse to skip your upcoming running or cycling sessions. Its 60mAh battery brings along up to 9 days of continuous usage time. This means that you’ll be able to get through the longest and most demanding of workouts without needing to worry about battery life. To take the most out of this sports gadget even after your workouts, it also features a sleep monitor. Thanks to this feature, you can be assured that you’ll always get the rest needed in order to recover. This will stimulate fast muscle growth and recovery in order for you to reach your workout goals in the most efficient way possible. This fitness tracker comes with a 12 months warranty, brought to you by the leader in electronic devices as well as wholesale electronic gadgets..